I did a random draw. And Minna Puustinen has won the signed copy of A Christmas Wedding Wager. I will be doing two draws for my December newsletter. One is a gift from Northumberland, and the other a gift to help writers revise. Be sure to look out for the contests in the next newsletter which goes out 6 December. This morning I was doing some research on the fashions of 1814. Okay , I should have been writing, but it seemed like a good excuse. I happened to look up La Belle Assemblee. This was the first fashion magazine. Anyway, in the January 1814 issue was this plate. My sister should recognise it as it has been on my wall forever. My great grandmother used to collect prints and this is one I was given. The colours on the web are more vivid than one I have. What you can not see are the curls in the woman's hair and the intricacy of the lace. Her cheek is a far softer pink and parts of the hat are not coloured in. Equally, the blanket is shown as green in this picture but in my print it is blue. And her foot rests on a blue footstool. Her slipper has a pink band over it but looks white instead of being dark as shown. The woman's dress in my print is all white and the pink of the braces is merely crosshatching. I know that sometimes the prints were hand tinted later and this could account for the difference. Engrav'd for No 60 New Series La Belle Assemblee 1st Aug 1814. Anyway, if anyone is interested in fashion from the Regency period, it is worth looking through the Belle Assemblee. It is very fun to see what well dressed ladies were wearing. I am however very grateful to my great grandmother and her collection of prints. There was a very interesting article in Publishers' Weekly last week about the fact that historical romance is NOT dead, but alive and well. This is in big contrast to the 2005 article that proclaimed it dead. Basically, I feel the interest in historicals is probably constant. Certain historical mixes have changed. For example, sweet traditional Regency is harder to find as Signet and Zebra closed their traditional Regency slots. Harlequin of course has continued to publish Regency and is doing very well with it. Avon also has done remarkably well with its historicals. Historicals are still hitting the bestseller lists and was one of the leading subgenres of bestselling romance. Several things have probably happened. First, the mix of historicals changed. Second, when the number of publishing slots contracted, it is quite possible the quality went up.Also fewer publishing slots, but same amount of readers means the books that are left in theory sell more. Publishers see the increase in sales and the cycle starts over again. Reading however is not a zero sum game. Simply because one genre is expanding , it does not mean that it is sucking readers from another genre. It simply means the quality of the writing in that genre is such that readers are responding to it. The absolute best way to grow a genre? Keep the quality up. Anyway, I am pleased that the quality of historical romance is starting to be recognised again. And the data is starting to trend upwards. There is a core of historical romance readers. I know. I am one of them. I should point out that there are a few days left to enter the contest for a signed copy of A Christmas Wedding Wager. The details are in my latest newsletter. If you do subscribe before the deadline of 30 November, I will send the details. The contest is for subscribers only. I will be sending out my next newsletter on 6 December and that will have details of my Christmas competition. Prizes will include a treat from Northumberland and copies of my back listed books. My current book is coming on. But I am suffering from a sore throat that won't quit and now having done my research on scarlet fever etc, I keep thinking -- strep and oh help. Seriously I do not know how medical authors cope. Needless to say, I am drinking lots of honey and lemon. Diseases over time mutate. People might not understand the exact mechanism but they do change. And the symptoms of a disease may or may not be the same from one period to the next. Take Rheumatic fever. I am currently researching scarlet fever as a character has contracted it before the start of the book. I was going to use polio but it wasn't really fully understood until approximately the 1830/1840s and as this story takes place in 1814, I want to have something where the boy has a chance of living. Scarlet fever is one of those things you read about -- think Little Women or the Velveteen Rabbit, but once I started to do my research I discovered that it is not scarlet fever that is the problem, but rather the rheumatic fever that follows. And around 1800, the nature of that disease changed -- rather than simply just attacking the joints, it began to attack the heart and the St Vitus dance or chorea appeared. Suddenly over half of the victims developed heart problems. Most recovering within six months. Then it took an even worse turn in the early 20th century. Anyway I would hazard a guess that part of the changing nature of the disease down to the over -crowded conditions. Several hospitals owe their existence to wealthy benefactors founding them AFTER their children died. It is a disease that is mainly confined to children aged 5 -15. Today, thanks to modern medicine, the incidences of rheumatic fever have been severely cut. Antibiotics form a good line of defence as does simple measures such as covering your mouth and nose when you sneeze and washing your hands before eating. I found it intriguing though how it changed through out history. But having discovered the answers I need, I now need to write the book, instead of led down ever increasing labyrinths of research. I found out yesterday that Taken by the Viking will be released in the US in May 08. They decided not to wait afterall until the entire trilogy had been completed. Also the sequel to A Christmas Wedding Wager is called An Impulsive Debutante and will be released in the UK in September 08. No news of when it will be released in the US. I am tremendously excited about the title as it does encapsulate Lottie. According to my editors, it took a very long time to decide on the right adjective. Now all I have to do is write the sequel to the one I just turned it. Wishing everyone who reads this a Happy Thanksgiving. For my readers. I love getting reader feedback and hearing what people think about my books. For the readers of this blog because it is nice to think that people enjoy it and it is not sheer indulgence. For my writing friends -- Writing romance brings me to contact with such interesting and giving people, people who make me see the world in different lights. For my critique partners -- Whose support is without measure and very useful for keeping the Crow of Doubt away. And even though they may not read every word, I know they are there, ready with to cast their eye. For my editors who are always willing to question and force me to dig deep, but whose interest lies in getting me to produce as a strong a book as possible. For my family -- who mean the world to me. May your Thanksgiving be joyous and may your life be filled with blessings -- both large and small. As you may or may not know, Amazon has released a new ebook reading device -- Kindle. Harlequin is very committed to providing ebooks in ALL formats, so it has released its front list and back list in Kindle. I believe ebooks are released to other sources besides eharlequin on publication date. So this means that The Roman's Virgin Mistress is available in the Kindle format now and A Christmas Wedding Wager will be available in Kindle on 1 December. I have no idea about ebook readers as I do not own one, but some people swear by them. I know they are very good for people who have failing eyesight and want large print at a decent price. A tremendously exciting archaeological discovery was announced yesterday. The Italians may have discovered the legendary Cave of the Wolf. This is the site where the she-wolf reputedly suckled Romulus and Remus. It was known that the sacred cave was somewhere in the honeycombed Palatine hill, but exactly where was lost in the mists of time until they happened upon it a few weeks ago. It is located under the palace of Augustus and faces the Circus Maximus. In many ways, it makes total sense. The Circus Maximus was of the important sites in Rome and most of the games did have some of nominal religious significance. Augustus wanted to basically re-invent Rome and its morals. He wanted to bring back the Golden Age of Roman values and wanted very much to align himself and his family with those values. Siting his palace over one of the most sacred sites in Rome, possibly the most sacred site at the time, is one way he attempted to do this. Augustus in many ways is a more interesting character than Caesar as he is basically responsible for transforming a Republic that was about to break apart into one of the world's great empires. He naturally wanted to align himself with the legendary founders of Rome. In some ways, I thought the tv series Rome did protray him pretty well. In others, I thought they missed the man. This is partly because Marc Antony (as protrayed by James Purefoy) was just som much more watchable. It appears that Augustus did have the cave refurbished as there is a mosaic of a white imperial eagle. The cave was central importance in the feast of Lupercol, a feast we still celebrate the remnants of today as St Valentine's Day. It is so wonderful when Rome yields up its hidden treasures. Apparently they are planning on reopening the palace of Augustus on the Palatine in February. It has been closed for decades. And I can rememeber the Palatine as being a rather dull and dismal place. I need to get working on my Regency but I find discoveries like this fascinating. My revisions went off yesterday. My editors made me dig deep and I do think the book is far better for it. Sometimes, it is very much a question of KNOWING that you should be asking questions and then forgetting. One thing my editors had me do was to look at the hero's attitudes towards marriage, beginning, middle and end. And breaking it down like that gave me added insight. Yes, I knew his attitudes changed,but could I pinpoint the exact moment they changed and highlight it. Reading through the ms I had submitted, I had to agree that the turning points were not as defined as they could have been. And because of that, the ending did feel flat. Anyway, fingers crossed -- all is well. I now get to do the next book, the sequel to this one. Hopefully the lessons I learnt in my revisions this time will come through with this wip and the revisions will be light. One always lives in thought. Although I do like challenging revisions. My newsletter went today, complete with the recipe for mincemeat. My next newsletter will be in mid Dec and will have a recipe for Lamb's wool punch. Cranford which had its debut on Sunday is excellent. It is one of those landmark BBC costume dramas. Eileen Atkins as the elder sister, Miss Dorothy steals the show. It is the interaction of the various character that is wonderful to watch. You get the feeling that here are people who have lives. Philip Glenister's character appears to be slightly Gene Hunt in 19th century. In other words -- strong and willing to act -- alpha male. The exact romantic lead has not been telegraphed -- Simon Woods is still in the running as is Greg Wise who plays Sir Charles Maulver. Time will tell and I prepared to shed a few tears, as I am certain several story endings will not end happily. BUT I know what I am doing on the next few Sunday evenings. I am doing the launch for A Christmas Wedding Wager over at Unusual Historicals today. The official publication date for Christmas by Candlelight is tomorrow. And A Christmas Wedding Wager is officially published on 1 December, but I know that Amazon.com and a number of other outlets already has it in stock. There a posting comments contest and the winner will be drawn by Carrie Lofty next week. My November newsletter goes out tomorrow and there will also be a contest there. I am hard at work on my revisions. The book is FINALLY coming together. It is going to be a great book. Truly. Yesterday I redid a scene that I knew was not powerful and not powerful and I couldn't think how to fix it. I think it is fixed. Oh the joy of finally getting it right. Tonight Cranford starts with all its bonnets. Five weeks of early Victorian England. Bliss. Because Alice inspired me to go and do some research and because I am still in the midst of my revisions, I picked up my copy of Swain again and started to read the introduction. He makes a certain of sense as long as I ignore the remark about love pulps. His basic point is that most published writers eventually figures out what works them. They develop a set of rules because human beings in general like to have some idea of how to go about things. But rules only work in writing when they come from the heart. If rules come from the head, then they can inhibit feeling. Story is all about the communication of feelings. Without that communication, it can feel flat and the reader does not get the tension and emotional release they crave. A big mistake writers can make is blindly following someone else's rules. They need to master the forms and techniques of writing. so they can have the tools to shape their work, but they should NOT be blindly following somebody else's pre-ordained pattern. The most important thing to ask when faced with someone else's rule is why. If you can understand the reasoning behind the rule, then you can figure out if the rule makes sense for you and your writing. The novice writer should not be asking how do I? But why do I and if I want to do xyz, what are the basic steps that I need to take. By knowing the why and the basic steps, the writer can formulate her own rule and her writing will retain that depth of feeling. It is one of the reasons why I think it is important to study craft, so that a writer can work the mechanics behind a thing and not simply accept that because something appears to have always been done in a certain fashion, it must continue to be done that way. So when you are faced with a set of rules -- ask why and see if they make sense for your writing. Then make your own set of rules that work for you. It is always about mastering form and discovering your own methods. Cranford starts tomorrow evening and I am very excited. It does look excellent. Simon Woods who plays Dr Harrison played Mr Bingley in latest P&P. Me thinks he might be one of the love interests. My revisions are going along and the book is getting much better. I have passed one of the really emotional bits and while most readers will go -- okay, so what;s new with the price of fish after reading it, I was trembling and tearful as I wrote it. But then my characters mean a lot to me. Alice commented yesterday about a few posts I had done in May on McKee's Story. In particular, she asked about the term story value. But I still can't grasp exactly what a story value is. Is it an emotion? An attitude? A state of mind. All of these? The short answer is all of these. Right, I suspect it is a case of not understanding the terminology used. Or the way the concept is described. It is one of the reasons why it is sometimes useful to read several books on craft. Not everyone gets the concepts in the same fashion. Both authors may be explaining the same thing but one makes you scratch your head and the other makes you have a light bulb moment. Swain in Techniques of The Selling Writer is very useful on the subject. My problem with Swain is his bigoted view of women's books, but it doesn't mean the concepts that he writes about are any less valid. On concept, he is brilliant. It is one of the reasons that his book remains in print. A story are made up of events but ultimately a story is a method of communicating feelings. Storys are all about emtion. Events have no meaning or change their meaning depending on whose POV you are in. In that POV, the character will have values (feelings, motivations etc). These values will be particular to that character and the story -- hence the name story values. They may or may not be values that the author holds. An event or happening without a value assigned to it is uninteresting, neutral. The reader wants to know how it affects the character. Is a rainstorm a tragedy or a blessing? Is a family birthday party where a toddler is given a wrapped present a happy occasion full of love and laughter or one fraught with tension? The answer is it denpends on the characters and the meaning they assign to it. The filter if you like through which the reader views the scene. It is the values of the character that assign the meaning to the event. If these values do not in some way change during the scene, what is the point of the scene from that character's POV? Why is it necessary for this character to change? It can be helpful when revising to make a note of the opening and closing values (feelings, emotions, motivations) of the POV character in a scene that feels flat. Have they changed? If not, this could be a reason why the pace feels off. the changes can either be huge or they can be the very turn of the tide, but they will have changed. If the value do not change, you will often experience a lack of tension. 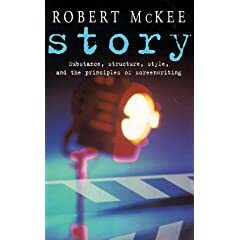 In other words, every scene must drive the story forward in someway. Stories only move forward with conflict and conflict implies change of some sort. Without the grit of change and conflict, the writer is spinning her wheels. Some of the revision that I have been doing has involved making sure the relationship progresses with each scene. This does not always mean that it progresses forward. It simply means that there is some sort of change. Does this make sense or do I need to take another stab at it? The yellow duckling is fine and well. It is going into pin -- i.e. its feathers are starting to come in. It appears no worse for the ordeal. The tiny reed pool has been filled as ducklings tend to be dumb about such things. I do think mother ducks can be very harassed with the silly things that ducklings get up to. The bird flu is far to the south of us. Very worrying for those involved and I see once again, they are attempting to blame wild birds. The strain involved was last detected on the German/Czech border in the summer, very probably early August. The incubation period for the disease is 3-6 days. Birds who are infected tend not to migrate. The time scale is awfully long for the disease to be within the wild bird population and to be unnoticed. Also one would need to look at patterns of migration and investigate if birds from the area routinely turn up in Norfolk/Suffolk. The wildlife reserve next to the farm had not noticed any problem prior to this outbreak. Bird wardens do tend to be vigilant. In short it is far too facile to blame wild birds and they need to investigate all the options. It sounds far more like infected meat/poultry feed. In other words, somewhere, corners were cut. The last outbreak in February was probably caused by imported turkey meat. Anyway, hopefully the outbreak can be contained relatively quickly. And I would point out that the H5N1 despite the dire predictions of several years ago has yet to mutate and there is no evidence of human to human passing of the virus. The revisions continue and I feel better about them. The book will be good. Yesterday, my dh who stayed at home from church with a throat infection looked out to see only six ducklings. 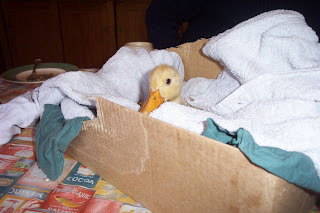 As they had been on a Big Adventure yesterday and had had to be rescued from the neighbours' yard, he was concerned about the missing duckling, the sole surviving yellow duckling of the brood. We suspect that a tawny owl might have eaten the other one. 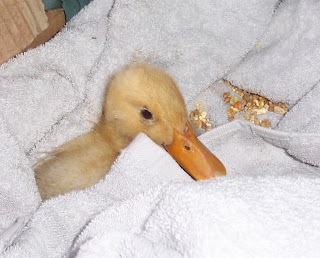 By the time I returned home, the duckling was well on its way to recovery. Once it was warm, it began cheeping its head off and we knew it was time to return it to its fellow ducklings. The mother can no longer be bothered with them btw and was engaged in head bobbing with a male duck. It is now fit and well. But I thought the picture might amuse. Today is not only Remembrance Sunday, but also Remembrance Day. It is the day to remember all those who made sacrifices in the various wars and their families. Last night, the BBC broadcast a moving festival of Remembrance. It was neither maudlin nor bombastic but it did highlight the sacrifices that the service men and women and their families have made over the years. I know that many read the poetry of the WWI poets on today, but I like A. E. Houseman. The last verse of his poem The Recruit says something about why Remembrance Day goes beyond the immediate families. There is an importance in memory. Today is about honouring that memory and the sacrifices the individual soldiers have made to so that we can live our lives today. A new compilation of Mrs Beeton has been published. This one edited by Kay Fairfax focuses mainly on the advice given for the management of the Victorian household and as such gives a fascinating glimpse into late Victorian life. Mrs Beeton was first published in 1861. I have long enjoyed rereading Mrs Beeton in the original for the wonderful tips on how to manage a Victorian house and servants. One of the joys of going to the Lit and Phil in Newcastle is to look at their copy of the Edwardian version of Mrs Beeton. I loved reading about what the servants should be doing. As it was an aspirational book, it gives detailed instructions. However, it is a huge tome with lots of recipes and hints on how to host a dinner party, so for the writer of the Victorian period, this new book is probably of more use. Fairfax has taken a room by room approach. 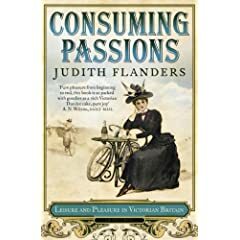 I see from the papers, Judith Flanders Consuming Passions is now out in paperback. Again, this is an excellent book for anyone interested in the growth of consumerism in the 18th and 19th centuries. Flanders' earlier book The Victorian House covers much of the same territory as Mrs Beeton's but it takes a wide view and uses a range of sources. Among other things, it has a detailed description of minutiae of mourning. Personally I find the detail about how people lived and how society rules affected homes etc far more useful (and fascinating) than political history. My dh would disagree as he loves the cut and thrust of battles. Carrie Lofty put the idea for this blog into my head after her comment about Richard Armitage's protrayal of John Thornton. Adam also popped up to say that he has done a fan site for The Cranford Chronicles. One of the things it includes is the start for Cranford on the BBC -- 18 November 9 pm and a variety of interviews, including one with Philip Glenister. Now I have no idea if Philip Glenister will be playing the hero in Cranford, (Simon Woods who plays Dr Harrison is a candidate as is Alisitar Petrie who plays Major Gordon) but I bet he will stealing scenes just as he did in Life on Mars where he played DCI Gene Hunt. Both Gene Hunt and John Thornton are alpha personalities. Both like the leadership roles they have but they approach them in different ways. Gene Hunt in that tv series is ultimately a 8. He cares about people once they become his. He is the King of the Jungle on his patch and he looks after people. He has a disregard for rules, because his main purpose to protect his team. He enjoys the challenge and wants to determine the course of his life. He is tough, but he has integrity. He dominates the screen. Protect and defend are really his watch words. He goes along with the status quo if it suits his purpose. John Thornton on the other hand is very much more a 6. He likes to follow rules. Either rules he has made for himself or rules society has made. He cares about his factory, but he demands his workers follow rules. He is a hard man but he is honest. He is searching for security for himself and to a certain extent for his workers. You see this in the way he refuses to risk the factory on a speculative gamble. It is only after he loses that security that he is able to break some of the rigid rules -- most importantly being able to take the risk and confess his love. I suspect Richard Armitage is a team player -- someone who learns his lines, gets on with it and is fairly punctual. If not, he knows why he is breaking the rules. In short he tends to play people who know the rules and are more comfortable with authority. He strikes me as being more comfortable playing characters who are in the 6 range. I suspect that Philip Glenister, although disciplined, enjoys stealing scenes. I suspect he will improvise if it is going to make a better scene. I think he feels very strongly about the shows he is in and is not adverse to speaking his mind when the authority might differ. In short, from what I have seen of his work, he strikes me as being far more of an 8. I could be completely wrong this but hopefully, it sort of demonstrates the differences between 6 and 8. First of all Nicola Cornick is doing a week long stint at e-harlequin talking about pirates, outlaws and pirates and why women are fascinated with them. Is it because women want to redeem? What is irresistible about a bad boy? Why is Johnny Depp so much more appealing than Orlando Bloom? Why is Sir Guy of Gisbourne more interesting than Robin Hood? Why is Mabel welcome to Frederic in the Pirates of Penzance, when I would fight for the Pirate King? (The elder two's high school is doing Pirates and my middle has been going around tarantraing and singing bits). Anyway, Nicola gives her take on why bad boys are popular in romance. I am being very good and not taking part as I am doing my revisions. However, if you look at enneagrams, you will see that the Bad Boy is actually a special type of the number 6 -- the Loyalist. He is the rebel. He is the person who breaks all the rules. In order to break the rules, he has to know the rules, and he is the sort of person (in theory) who does want to keep rules but only on his terms. The interesting question is why? The general answer is that they have felt let down by their parents and the rules they used to keep. But these are the people who rebel. They are not trying to be successful rebels, they just breaking the rules. Number 6 also generally have a code of honour. People sometimes dismiss number 6 loyalists as being very beta and boy next door, but if you look at them in the context of the Bad Boy, you can see that they are a truly interesting type, a man that needs to be tamed. For example, I think an excellent case could be made that Vidal (The Devil's Cub) is a number 6. He is a man who lives by rules. He never breaks his rules -- just polite society's. He is ruthless. And ultimately he is wonderful and tamed by Mary. My fingers are crossed that Cranford, the new BBC series based on three books by Elizbeth Gaskell, is as wonderful as it looks. They had a preview of it on the BBC the other day. Early railways. Scandalous whispering. Changes in society. Romance. Costume drama at its best. Philip Glenister is in it but he looks to be far more stiff upper lip than normal. And I have seen pictures of a Simon Woods. In other words, I am not sure who the hero will be. Dame Judi Dench is in it, heading an all star cast. Some of the filming was done in Wiltshire and you can see photos of it here. It looks like it is going to be excellent. It will be shown on Masterpiece Theatre in the US, I think as it was filmed in conjunction with WBGH Boston. Anyway, I can't wait. Right back to my wip -- the Tyne Valley and my bad boy hero. It is coming on, honestly. One of Barbara Vey's very lovely Weight watcher ladies has done a review for A Christmas Wedding Wager and it is up on the Beyond Her Book blog today. If you haven't discovered Barbara Vey's blog, it is a really interesting blog to read. I thoroughly enjoy reading it. The one wish that Loretta had was that there would be a sequel and regular readers of this blog will know -- there is one. My lovely editors still have not titled it, but it is Lottie Charlton's story. My daughter begged and pleaded and kept point out how she deserved her own story. And I know my editors loved the story as well. Loretta also said that she was now a convert to romance so that made me very happy indeed! There was a post on Romancing the Blog yesterday and Julie Cohen also did a blog awhile back on JK Rowling's revelations about Dumbledore. I will admit that I wasn't surprised, mainly because I had read the last book and knew about his intense relationship with Grimwald, and it did remind me of the Charles Ryder/Sebastian Flyte relationship in Brideshead Revisited. I also tend to think of Dumbledore as a Mr Chips type character. He was someone who loved passionately once (perhaps unwisely) and then suffered. It also goes someway towards explaining why he was wary of Tom Riddle -- namely that his pursuit of knowledge echoed Grimwald's. Or was it his own and he knew what dark passages it could lead to if unchecked. In many ways, it doesn't matter as the main story would have still played the same, as the end result is the same. But it does through up an intriguing question -- authors have to know much more about their world than readers do, should they share that knowledge? Or should it be something that readers if they want to can fill in the blanks? And when should that knowledge be shared? Because sometimes, if the author is going to write more stories about that particular milieu, the author could need to keep secrets. When I am writing, I do know why other characters are in the cast and what their backgrounds are. The tip of the iceberg principle. I do a lot of research on both the setting and the characters that populate the worlds I write about. It is always a juggling act - -what does the author need to know and what does the reader. For example, with The Gladiator's Honour, I knew the whole back story of Aquilia and how he came to be as well as how Tigris and his wife met. With A Noble Captive, I had to know how Helena's aunt became the sybil and Helena's mother was like and her romance with Helena's father. I also had to understand Tullio's relationship with his former wife. With Taken, I could describe the whole journey Haakon took with Asa ten years before the book started. I also know a lot about Asa's motivations and about Thorkell and the court intrigue. With A Christmas Wedding Wager, I ended up know all about Lucy and Henry Charlton's courtship and the Charlton family dynamics. This held me in good stead when I came to write Lottie's story (still untitled but will apparently have the word Debutante in it and possibly scandal). BUT the information does not really impact on the story and readers do not need the info to enjoy the story. In fact if they did know the info, the focus would be lost and the pace would slow to a crawl. Hopefully, the knowledge I have ultimately makes the world more real to the reader. However, if the end result stays the same does the motivation of a secondary character matter to anyone beyond the author? I would argue very strenuously that an author needs to know the motivations of their secondaries, in particular their major secondaries if they want to avoid two dimensional characters and flat worlds, but should they reveal it afterwards? Is preliminary work interesting or distracting? Or does it depend on the author and the book? I am undecided about it but there again, I am a writer and I like to play guessing games about characters. I am blogging at Tote Bags today about preparing for Christmas and am giving away a copy of A Christmas Wedding Wager. My newsletter should go out at the weekend and it will contain another chance to win a copy of A Christmas Wedding Wager. When we were in Malta, my middle and youngest discovered a new drink -- a Cinderella. They first tried at the Blue Elephant but soon discovered that other restuarants would serve it. Having tried it, I think it is better than the Shirley Temples that I used to drink as a child. The basic recipe is for one person 4oz (250 ml) orange juice, 4 oz (250 ml) pineapple juice, the juice of one lemon, 1/2 oz (50 ml) sugar syrup and about 4 oz sparkling water. Shake with ice and pour into a glass. Sugar syrup is made by boiling about 200 ml water combined with 200 grams of sugar for about a minute. My middle prefers less sugar syrup for a tarter taste. I suspect there is a drink with a bit of vodka added for the adults but do not know the name for it. Anyway, it is a refreshing drink. You can make it even more luxurious if you used freshly squeezed oranges and freshly juiced pineapple. The revisions continue apace. Yesterday, one of Kate walker's questions resounded in my brain -- why would she fall in love with him beyond the obvious? And I realised that I was missing a scene. This meant that the pace felt a bit static. But it is coming on and the book is moving more how I want it to move. It is always important to ask -- why. Or otherwise one's editor is apt to ask it. Yesterday, when helping my dh with the bonfire, it was basically still. My dh froze and cocked his head. A large smile appear on his face. Then I heard it as well -- wing beats flapping far above us. Two swans soared over our head -- large and majestic with wing beats so loud that you would almost think they were calling out. My dh and youngest later went birdwatching up at Grindon Lough and saw seven Whooper swans. It has been a long time since my husband has seen Whoopers there. He had thought the swans he had seen earlier were whoopers but hadn't wanted to say. We mainly get Bewicks. Grindon was positively teaming with winter migrants -- grey lags, field fares, huge flocks of golden plover and lapwings as well. They were so excited that they came back for the telescope. Generally Whoopers mean a cold winter. But it was the sound of their wings in the air that will stay with me. At the moment much to my dh's delight, my youngest is very gone on birdwatching. Other people might find collections of stuffed birds boring or uninspiring, but my dh and youngest spend ages looking at them, discussing them. My youngest has started submitting bird reports to the local bird club and I believe is taking part in the Bird Atlas by submitting roving reports. As I was finishing my work on my wip for the day, I suddenly heard a loud screeching call. My dh came in from the garden to report that a tawny owl had flown directly over his head and he could see the markings. We apparently have two in the dene and they were calling to each other. Tawny owls have an almost unearthly cry. They fly on silent wings. One of the enduring features of a Regency is the ball. However, when you go around a variety of country houses, there are not as many ballrooms as one might think. Also many of them have been changed out of all recognition, and let's face it -- they look very different at night and lit up by candlelight. So I was delighted when my copy of the English Heritage magazine showed up and it had an article about ballrooms -- their growth and function. It was quite timely really. I have loved ballrooms ever since I saw my first proper one. My high school was housed in an early 20th century mansion and boasted a ballroom where we had early morning assembly. I would often close my eyes and imagine what it would be like to waltz there as it was that sort of place. In the mid 18th century, balls mainly happened in public spaces such as Assembly Rooms. The Newcastle Assembly Rooms were finished in 1776for example. The magnificent chandeliers are still there and the Grand ballroom does retain a definite flavour of the time period. Almacks -- the Assembly Rooms for the Haut Ton in London was founded in 1764. Most towns of any note boasted some sort of Assembly Room. The subscription balls were widely popular and it was not unknown for carriages to queue for up to 2 hours. As an aside the required uniform for Almacks -- Beau Brummell's evening costume only came about in 1801 when the Beau was at the height of his powers. Prior to that time, male evening dress was far more brightly coloured. As the 19th century dawned, ballrooms started to be Incorporated into country houses and large town houses. This mean the balls could be more private and that it gave the opportunity for more social jockeying. People would go to several balls per night in the Season, saving the most desirable for last. One important feature was the wooden floor and this made ballrooms expensive to keep up as the floor needed to be highly polished. The most popular colour for ballrooms was yellow. If you look at the Assembly Rooms Newcastle, you can see that the colour does work. I used the Assembly Rooms in both A Christmas Wedding Wager and Lottie's Story ( which remains untitled but should have Debutante, Secret or Scandal in the title-- but this is up to my editors). However, the ball in my latest wip, takes place at private house in the Tyne Valley. The NT houses in the area don't have purpose built ballrooms. Luckily for me, I recently went to a meeting at Minsteracres and the 19th century ballroom is still there. It has lots of gilt and mirrors. The walls are probably more late 19th century as they are painted with flowers but it did give me scope to use my imagination. More so than when I visited Close House as it uses the ballroom as a dining room. for a friend's wedding anniversary. But it still gives one ideas. Anyway, I just like ballrooms and the article in the English magazine is excellent and timely. It is warm in Northumberland. Too warm. The Oriental poppies are blooming. Normally these bloom in June to coincide with ducklings. (Somehow we lost a duckling this morning and so are now down to 8. I still can't bring myself to put them in a pie!) The gaudy pink summer flowers are now contrasting with the crisp colours of Liquid Amber birch and the beech. And there is a colour clash..
Maybe the flowers etc know some thing I don't. Maybe all the rain we had earlier this summer felt like a winter. I don't know. All I know is my plants are acting strange. And I am still in t shirts in the house. Normally I take Eileen Ramsay's advice and wear two sweaters at this time of the year as I do not like having the central heating on. Not this year. I want my November to be cold and frosty. Maybe even snowy. 11 years when we moved to our house, snow lay on the ground for weeks. The movers could not get the tea chests to me until a few days before we moved. Somehow, I can't see this happening here this winter. BUT all the signs are that someone is going to have a hard winter. Geese and siskins arrived early. The holly bushes are full of gleaming red berries. There has been a bumper crop of apples and pears. The bees are still flying and I need to take out the varroa strips and make the final preparations for winter -- namely putting the mouse guards on. Mice will try to hibernate in beehives and can thoroughly disrupt a colony. I do not worry about extra feeding as we have plenty of ivy and late autumn flowers, plus a number of winter flowers including winter aconites, snowdrops and hazel. The bees as a general rule of thumb have enough to see them through. If they feel a bit light in February time. I will give them a sort of Royal icing type feed -- apifondant. My revisions are coming on. The basic problem with this book is that I did not make one key conflict personal and so it ended up being far more external than internal. at my wonderful editors' suggestion, I am internalising it. It is working far better. My editors are there to make the hard suggestions and to tell me to take a second look at those areas that are not working. fingers crossed that it is going to work this time. Already I can tell it is getting better. Free Rice -- it is a word game, for every word you get correct, they donate 10 grains of rice to the UN World Programme. It is addictive. I am busy with my revisions. There is a good book in there, waiting to come out. It is a matter of changing a few things around and making sure it is going to be a super read. Ultimately I want the reader to have the best experience possible. In sad news, the legendary HM&B writer Anne Weale died suddenly on 24 October. She wrote 88 novels for Mills and Boon, her first one -- Winter is Past in 1955 and her last in 2002. A career that spanned nearly fifty years. When I first started reading Harlequin, I know that she was one of the authors I reached for. Her specialty was the Sea Story. Among other things, she was one of the founding members of the Romantic Novelists Association. Liz Fielding has done a lovely tribute to her. Sybil's comment and Julie's reply in my blog about Latest Romance stats made me going looking to find out more about Debbie Macomber and her publishing history. This year she celebrates 25 years of being published and all with Harlequin. However, it is only within the last few years that she has become the household name that she is. In June 2006, Publishers' Weekly did an article on the selling of Debbie Macomber and it makes for interesting reading. It was quite clear in my mind when I read that article that the vast majority of the Reader Outreach programme had come from Debbie and from her heart. She believes that a readership is built reader by reader. Harlequin in the aritcle estimated that Debbie has a core readership of 200,000 who can be counted on to buy everything she writes. Things Debbie does to reach out to readers include a regular newsletter, an annual posted newsletter, maintaining a blog and a website. She has also created several knitting pattern books. But when she first started, she was not tipped as a star. She was simply a Silhouette series writer. It all came from her and her desire to reach out to readers. And if you visit her website, it does show. The other key consistent is that she has kept the quality of her writing up. Paula Eykelhof has been her editor for over 20 years and I would assume has given her quality editing. Personally I like the term -- Reader Outreach rather than PR. It is the readers who are important, in particular that special subset of readers that love and adore an author's work. On that note, A Christmas Wedding Wager has gone on sale at eharlequin both in print and as an ebook. In my November and December newsletters, there will be some of the recipes from the book including the recipe for Mrs Charlton's Lambswool Punch and Emma Harrison's mincemeat pies.